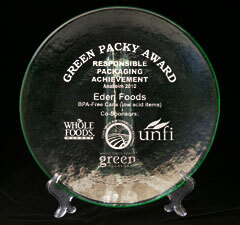 Clinton, Michigan - Eden Foods has been commended with a "Green Packy Award" based on the Responsible Packaging Guidelines for the Organic Industry, a collaboration headed by Whole Foods Markets Green Mission's Responsible Packaging Forum. With the proliferation of green packaging claims - "green, sustainable, responsible, degradable, recyclable, bio-based, etc." - the forum is working to establish a shared vision for responsible packaging by encouraging food purity, ecological practices, and developing congruent metrics. This responsible packaging award was given to Eden in recognition of using BPA-free cans in all 33 of its organic beans, including chili, rice & beans, refried, and flavored. Eden beans are prepared in steel cans coated with a baked-on oleoresinous c-enamel, which does not contain the endocrine disrupter chemical, bisphenol-A (BPA). Oleoresin is a non-toxic mixture of oil and resin extracted from various plants, such as pine or balsam fir. These cans cost 14 percent more than industry-standard cans that do contain BPA. Eden is the only U.S. food maker to use BPA-free cans, and has been since April 1999. Eden Foods received this award at the Natural Products Expo West trade show in Anaheim, California, on March 11, 2010. Eden Foods is a 42 year principled manufacturer of natural food offering more than 250 authentic, organic, traditional, , pure foods. All are superb pantry fare. Information and over 975 free recipes are at www.edenfoods.com. Retailers, institutions, and co-ops, please visit us at access.edenfoods.com.